November 15, 2018 by Ecommerce News. About Statistics with tags Russia. 5015 views. Ecommerce in Russia was worth over 14 billion euros in 2017. This corresponds to an increase of almost 13 percent compared to the situation one year before. For this year, it’s forecasted that ecommerce in Russia will grow again with a similar percentage, so it will be worth 15.9 billion euros. 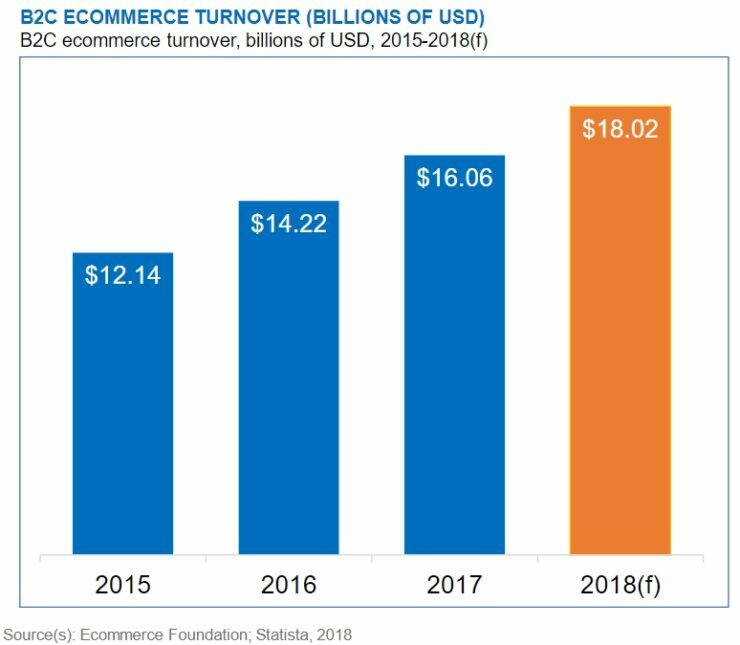 This can be concluded after reading the Ecommerce Report Russia 2018 from the Ecommerce Foundation. The news that ecommerce in Russia was worth over 14 billion euros last year, slightly corresponds with the prediction of Russian Post and the Association of Internet Trade Companies (AITC) in September 2017. There’s an increasing number of Russian people who shop online. In 2015, the online shopper penetration was 37 percent, when over 38.6 million Russians shopped online. For this year, the penetration is expected to reach 47 percent, which means 50 million people will order products and services online. In Russia, 56 percent of consumers shop both domestically and cross-border. Another 14 percent shop cross-border only, while 30 percent only order products and services online at Russian retailers. In this country, Alibaba is the online store with most unique visitors, followed by Yandex, the Ozon.ru sites and M.video. A consumer survey by Statista from 2017 shows that 76 percent of the Russian population used online stores in the last four weeks prior to the survey. That percentage is higher than for consumers who used video websites or social media apps during the same period. In Russia, the most popular product categories (in terms of turnover) are household appliances & electronics, clothing & footwear and computer, notebooks & computer parts. When asked what kind of products consumers mostly order online, electronics, clothing and household appliances are the most given answers. Statista also asked Russian shops how they have conducted online payments in the last twelve months. ‘Online payment’ was answered by 59 percent of respondents, while credit card (39 percent), cash in advance (35 percent) and paying by invoice (also 35 percent) are other popular online payment methods in Russia.